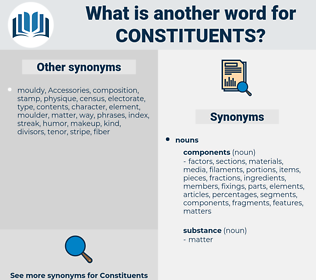 What is another word for constituents? composite, connecting, election, parts, Compo, voting, Polling, feeds, artifact, Nunavut, OBD, component, components. 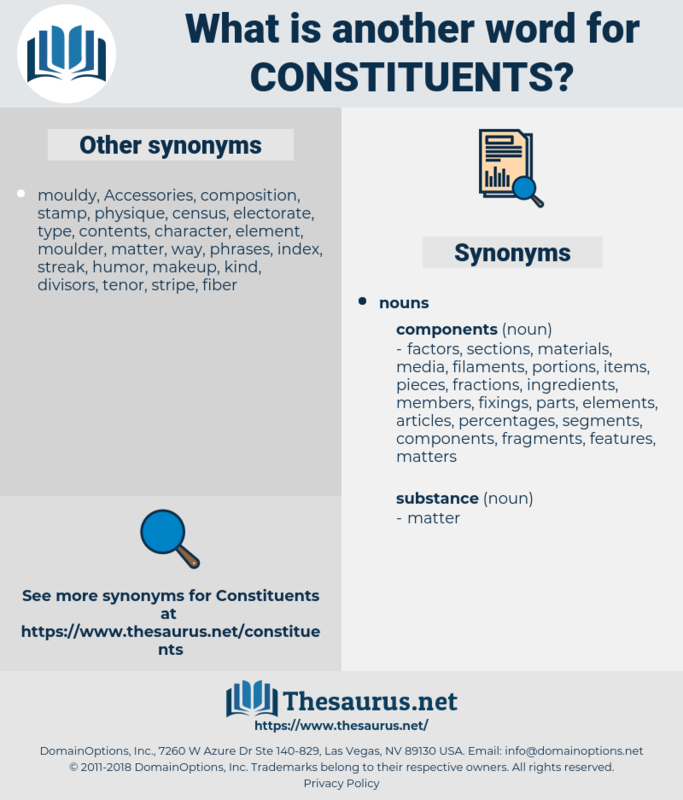 constitution, Constitutions, constituted, correspondents, contingents, co-citizens, contents, subcomponents, co-rapporteurs, cornerstones, contaminants, considerations, interlocutors, sub-components, discussants, composites, fellow-citizens, recipients, prerequisites, nutrients, composition, compositions, commissioners, citoyens, consignees, factors, characteristics, sections, contributors, feedingstuffs, ingredients, Commodities, compartments, points, sub-sectors, Communities, segments, Clients, determinants, Respondents, participants, Environments, groupings, proponents, representatives, residents, Administered, pollutants, substances, things, counterparts, elements, settings, principles, communicators, Entities, connectors, represents, associates, registrations, signatures, adherents, interveners, electorates, details, practitioners, destinations, informants, names, regions, candidates, VECS, customers, species, contacts, subscribers, Participated, fractions, supporters, pieces, entrants, memberships, shareholders, Counties, mainstays, interviewees, panellists, Spokesmen, inputs, mixtures, subjects, Assemblies, sectors, compatriots, tiers, intervenors, inhabitants, citizens, polls, clusters, Countrymen, quarters, audiences, stakeholders, Records, vouchers, grassroots, dimensions, extenders, chemicals, humans, Beneficiaries, aspects, districts, clearers, devices, partners, headings, clientele, FACETS, divisions, partisans, attributes, proceeds, providers, principals, exchanges, grantors, objects, Deputies, localities, portions, followers, affiliates, users, media, habitants, grantees, guests, membres, member, members, Boundaries, receivers, sponsors, presenters, actors, peacekeepers, materials, responders, strands, fellows, products, delegates, VOTES, NATIONALS, ballots, attendees, Branches, personnel, forces, mandates, deliverables, blocks, traders, patrons, locals, addressees, additives, adopters, factions, Categories, shutters, speakers, people, burgers, additions, facts, backers, advocates, Habitats, masters, mix, mixes, flaps, stages, Foundations, players, features, pillars, pouches, individuals, taxpayers, packages, masses, items, particulars, callers, Tracks, layers, groups, outputs, streams, limbs, Bodies, circles, officers, dwellers, sides, Phases, trades, fans, targets, civilians, units, panels, ridings, backgrounds, Ods, publics, Canadians, Axes, bags, states, Parties, elections, goods, parts, feeds, component, components. You, Representatives, amongst whose constituents are those very persons for whom these places of refuge are principally designed, have expressed a kind and grateful feeling for the personal share which I and the Queen have taken in the labor of securing the necessary means for the establishment of a Hospital in Honolulu. A letter from one individual should never be allowed to create interference between a member and his constituents. concatenate, Chinese Chestnut, consistent, coincident, constant.